Ask about group accommodations and nearby event sites at 831-372-5000 for free event planning during your next most special event. Whether it be a wedding, vow renewal, family reunion, team building or company meeting, Horizon Inn has reasonable guestroom rates and the town offers many venues from restaurants and theaters to on the sand at the beach! The Horizon Inn is contemporary mission style and rooms are tastefully decorated and have convenient amenities. 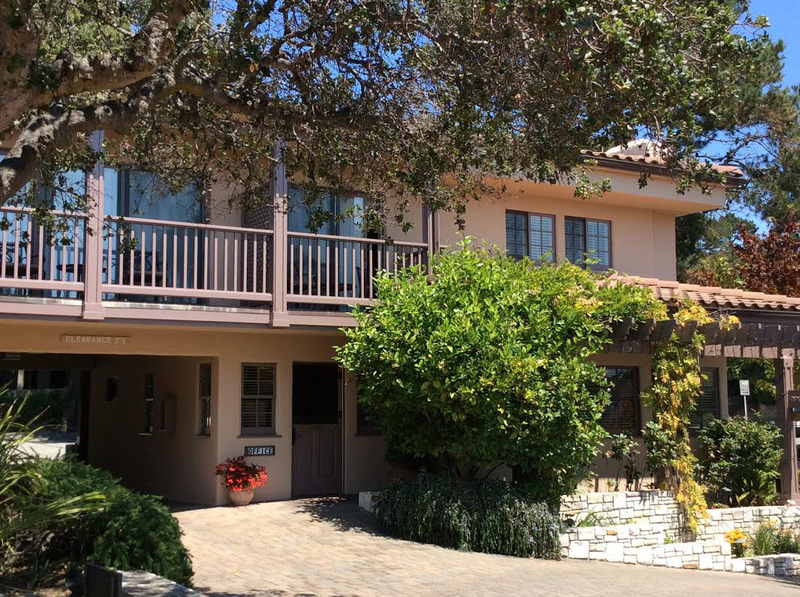 In many of the rooms you sit on your balcony overlooking Carmel Bay, Point Lobos and the Santa Lucia Mountains and watching the sunset. The patio, with stone fireplace, hottub and garden furnishings, is a great place to relax outdoors. All sorts of amazing dining and cuisine options are just steps away from the inn located on Junipero Ave at 3rd St. Tile roof, stone pavers and plaster enhance the aesthetics of this tranquil yet convenient inn. A breakfast basket is freshly filled with goodies and delivered to your door each morning and includes feshly baked pastry, granola, fresh fruit, juice, milk and the daily newspaper. All rooms have table and two chairs and mini suites offer you a queen size sofa sleeper for your beloved traveling companions. There are romantic jacuzzi rooms with fireplaces and offer cozy robes and slippers for your relaxation. All rooms give you refrigerator, coffee maker, microwave, magnifying mirror, iron and hair dryer. Many rooms have gas-burning fireplaces with king size bed. There are two rooms dedicated to the specially abled visitor. Also of note is that the 100% off-street parking for your vehicle is located on property. Carmel is near to golf, tennis and spas. Day trips to local wineries, the Monterey Bay Aquarium add to the honeymoon and romance of the area. As do the beautiful sunsets, wonderful art galleries, dining and unique pubs.